The NU-Materials Research Science and Engineering Center is an interdisciplinary program focused on multi-functional nanoscale material structures. Over 30 faculty from 7 different departments are involved. REU students will have the opportunity to contribute to a research project led by a center faculty member and will participate in interdisciplinary research group meetings, expanding their science and engineering experience into a range of fields. Students with an interest in nanomaterials and majoring in a science or engineering field are encouraged to apply. Each student will be assigned to a graduate student or post-doctoral associate mentor who will work closely with them. For an overview of Center research, please visit our research section. A list of some previous projects is also available. Each summer, a range of projects is available in both experimental and theoretical/simulation fields. At the end of the REU program, the participants will write a technical paper and give a 15-minute oral presentation on their research at a symposium open to the public. Other program activities include a field trip to a national or industrial lab, a beach party for social networking, a panel discussion on graduate school admissions, and seminars by Northwestern faculty and graduate students. Chicago is only a half an hour away with easily accessible public transportation, and city events such as the Taste of Chicago take place throughout each summer. REU participants receive a stipend of $4,500, plus on-campus housing and a travel allowance. Since our start date is later than most other REU programs, this is the perfect summer program for students whose schools are on the quarter-system! While there is no strict GPA requirement, the average GPA of admitted students is typically above 3.5. However, we do look favorably upon students who can work through adversity. Most accepted students are rising junior and seniors, though we encourage exceptional younger students who have some independent research experience to apply. You must nothave completed your degree before the program begins. Due to NSF funding requirements, our program is open only to U.S. citizens or permanent residents. For further information, contact mrc-reu@northwestern.edu, 847-467-0470. 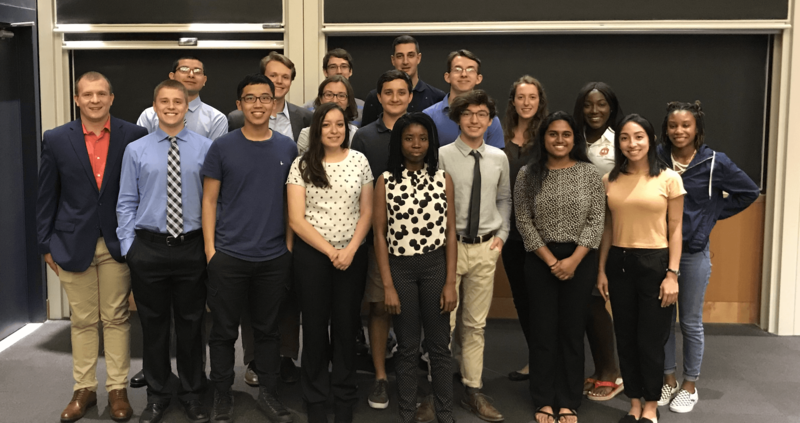 The Northwestern University Materials Research Science and Engineering Center (NU-MRSEC) offers an Academic-Year Undergraduate Research Internship program. Students have the opportunity to conduct experimental, theoretical or computational research in various areas of materials science within the laboratories of MRSEC-affiliated faculty. For an overview of Center research, please view the MRSEC research website. Participants will receive a stipend of $15/hour for the academic year and are expected to work for 10-20 hours a week. To be eligible for this program, you must be a Northwestern undergraduate student majoring in a science or engineering field and be a U.S. citizen or permanent resident. Participants wishing to receive academic credit for the project they do during the URI program must consult with their departments (most departments will not give academic credit for the same work for which a student receives pay). The internship is compatible with the Federal Work-Study program, but students do not need to be Work-Study eligible to participate. We are currently accepting URI applications for 2018-2019. Application deadline is Monday, October 15, 2018. Please contact w-kung@northwestern.edu for any questions.